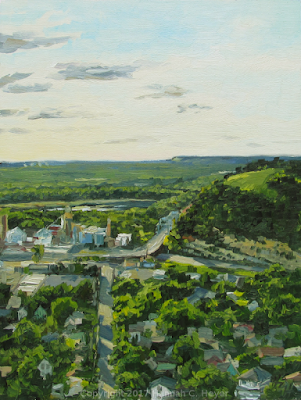 After checking in at the Depot Gallery and getting a bunch of panels stamped for the event, I drove up to Memorial Park on Sorin's Bluff, which has a great view looking over the city, and is a perfect place for watching the sun set. Painting a view like this is very different from what I usually paint, and trying to simplify all the shapes and colors of the houses and buildings and trees below was a big challenge for me. 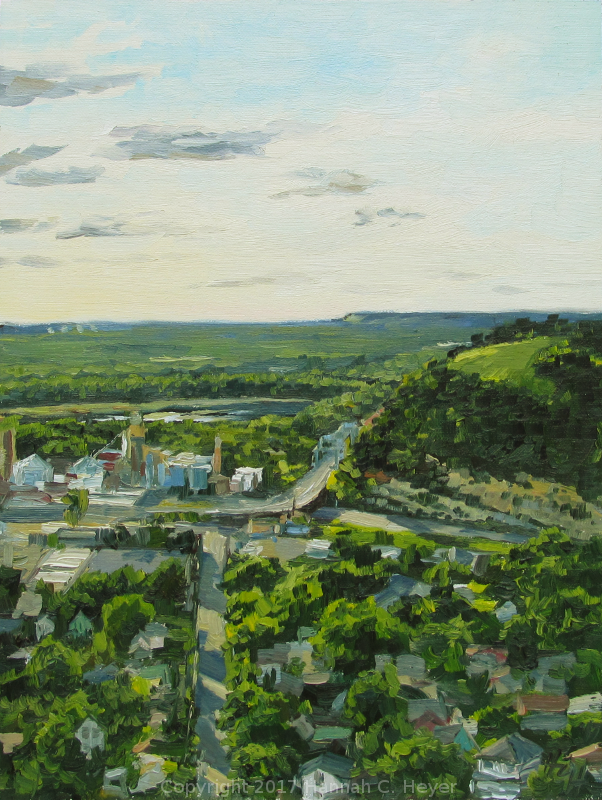 I liked the slanting shadows that could be seen across the street below, the bright greens of the trees and the clearing on the west end of Barn Bluff, and the long view over to Wisconsin in the distance. 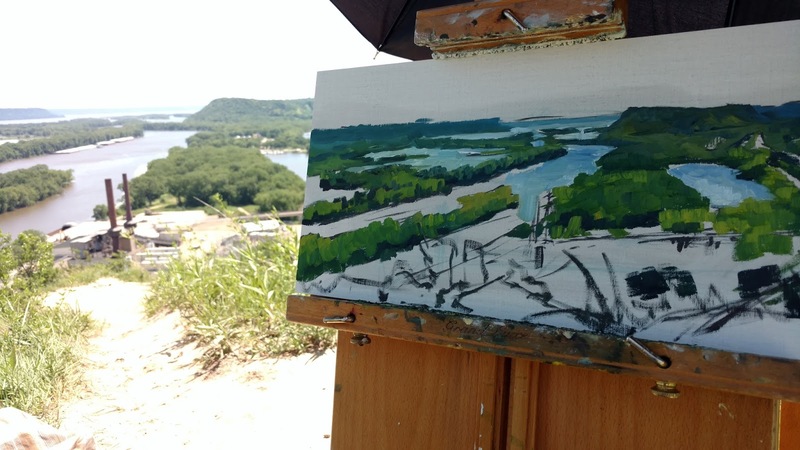 Hiking up to the top of Barn Bluff with an easel and bag full of gear on my back isn't exactly enjoyable, but once at the top it is so worth it. 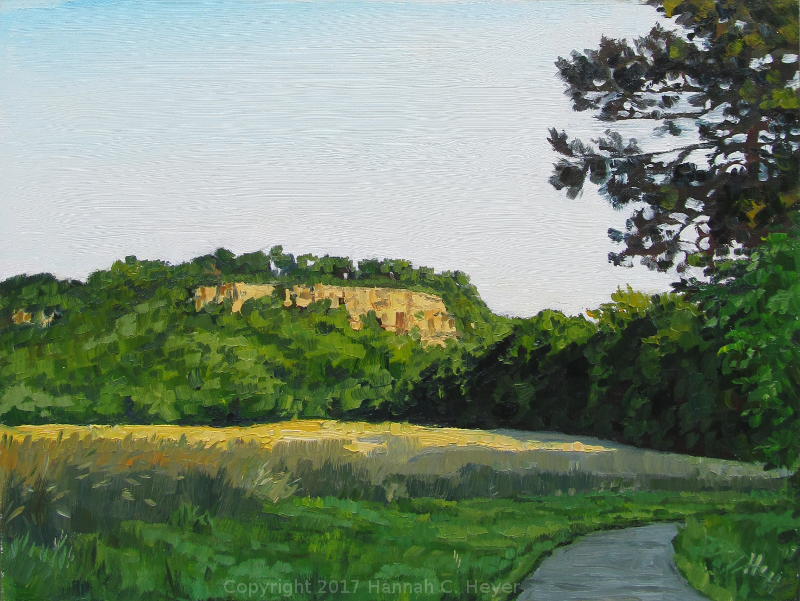 The Prairie Trail wends its way through blowing grasses and wildflowers to the eastern tip of the bluff, which overlooks the head of Lake Pepin. 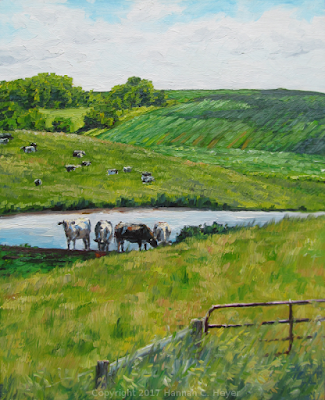 I've painted here before, and this time I brought an 8 x 16 panel to paint, to capture more of the wide view. Half-way into blocking in color. I really enjoyed working out in paint the shapes and patterns of the river here. A beautiful puzzle. Notes for next time: Eat a bigger breakfast - cheddar crackers just don't cut it. Wear sunscreen - the wind may make using a hat or umbrella difficult. Favorite overheard story while painting: "Grandma was smart to bring him up here! No wonder Grandpa fell in love with her!" Dinner with some of my favorite painters, and then back out. I headed to Wacouta, where I also did some painting and exploring last year. Looks like the fields were planted with rye again - so pretty! And there was something very homey to me in the subtle, sweet fragrance of the field in the evening. 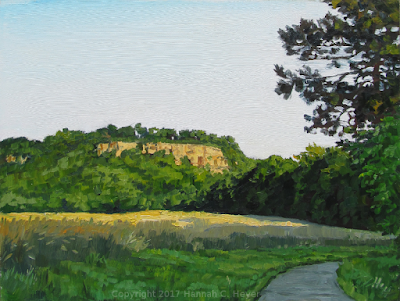 I walked down a little ways on Rattlesnake Bluff Trail to get closer to this corner with its contrast of shadow and light on the standing grain. A soggy, gray day. 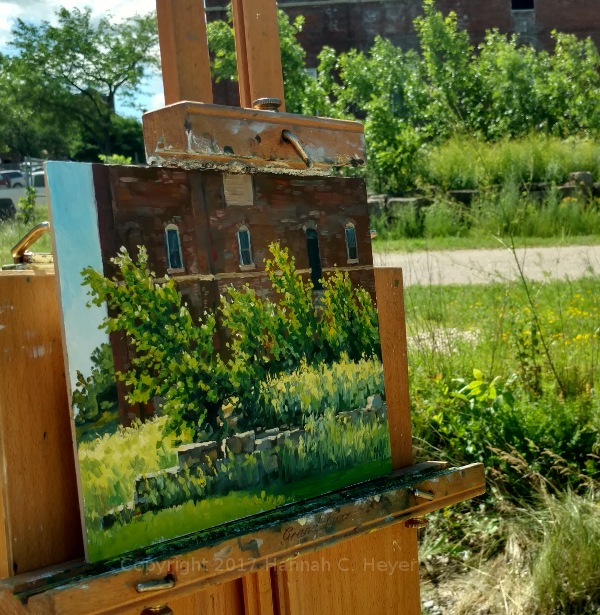 Artist Jim Turner suggested we go paint at Kelly's Taphouse, as we'd seen a good viewpoint from their patio the day before. They were so gracious and let us move tables and chairs and set up our easels to get almost out of the rain. It was so wet and humid that Jim's watercolors wouldn't dry! My oils worked out a bit better. 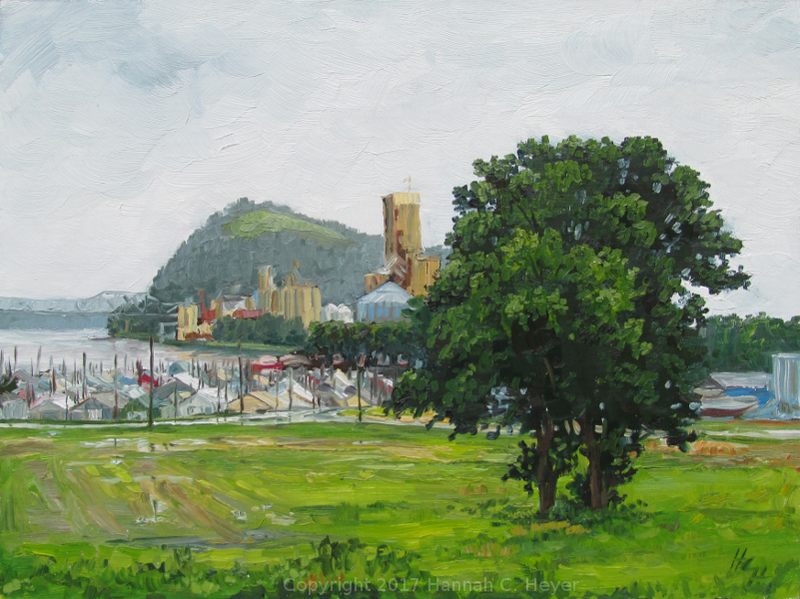 The rain came and went and came again, but all the moisture in the air lent a nice depth to the scene of boat houses and Barn Bluff. Of course, I like my trees, and these two stood out so full and sharp in the wet weather. Late evening the clouds finally began to break, and I tried to capture a bit of that standing under Maiden Rock and looking out over Lake Pepin. When I was nearly finished, the sun broke through just before setting and the whole sky and river was aflame with pinks and orange and gorgeousness. I may have to attempt that scene in a studio painting in the future! 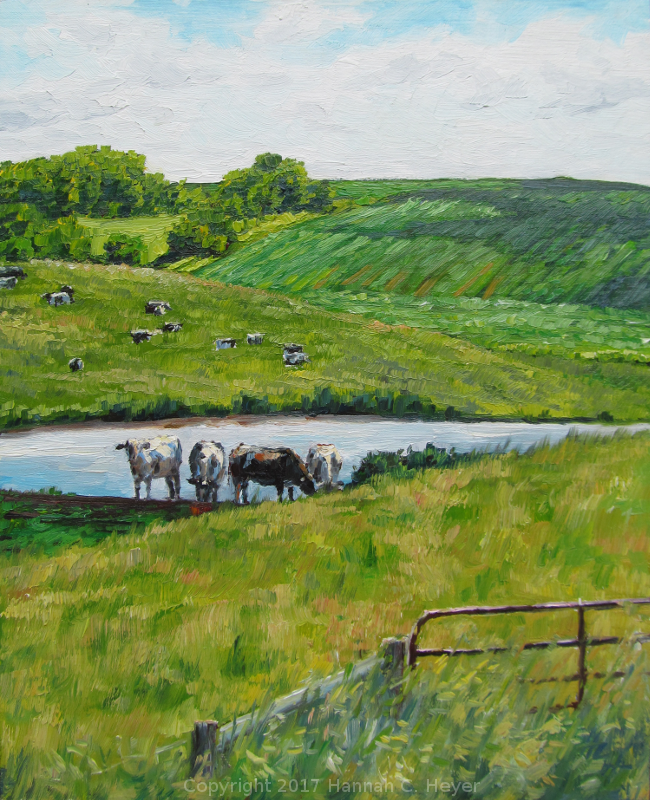 Headed out painting with Jim again, but I left him painting what would become an award winning piece, and backtracked to visit these cattle I'd seen on the way. 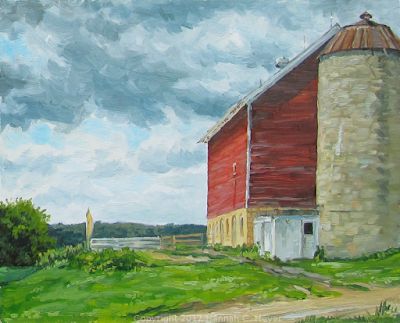 This time of year is so green in Minnesota, but there are still a lot of variations and I want to be able to show the richness of the landscape without making it boring. There is always a lot to learn. 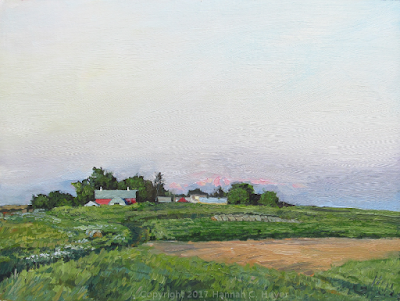 The clouds began moving in as the day progressed, and their shadows moved across the growing corn in the field beyond the pasture. In the afternoon I ended up at Flower Valley Vineyard on Orchard Road. I'd driven past this barn before and knew I wanted to paint it. The dark clouds moving through set off its red sides nicely. It was built in 1872, and has beautiful stonework and narrow horizontal boards; barn swallows nest under its eaves. The weather alternated between rain and sunshine, with occasional umbrella-flipping wind gusts. Friday evening we all turned in three framed paintings to be hung for the show, and had a little gathering with the artists and arts association volunteers (and food!) which was really nice. Quick paint from 9 to 11 am! The sun came out just in time. The wind blew out of the north and it was surprisingly cold for a June day. Half-way through painting I ran back to my car to grab a sweater - it's hard to paint a straight line in the first place without adding shivering to the mix! This spot is just across the street from the depot, and it always catches my eye. I liked how the morning light caught the wind-blown trees and grasses and made them stand out against the dark background of old brick. Quick paint on my easel. 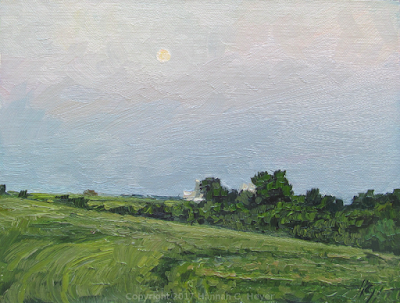 A Little Wild Place - 8 x 10" oil on linen/hardboard. This year's judge was Joshua Cunningham. I became acquainted with him and his work the first year that I was part of this event - in 2011 - and have been a fan ever since. He did a demo in the afternoon, through occasional spits of rain and amidst a mostly shivering crowd of onlookers, who sometimes left to go find jackets or coffee. It was great to watch his painting develop and have a chance to ask questions. My four paintings in the show. 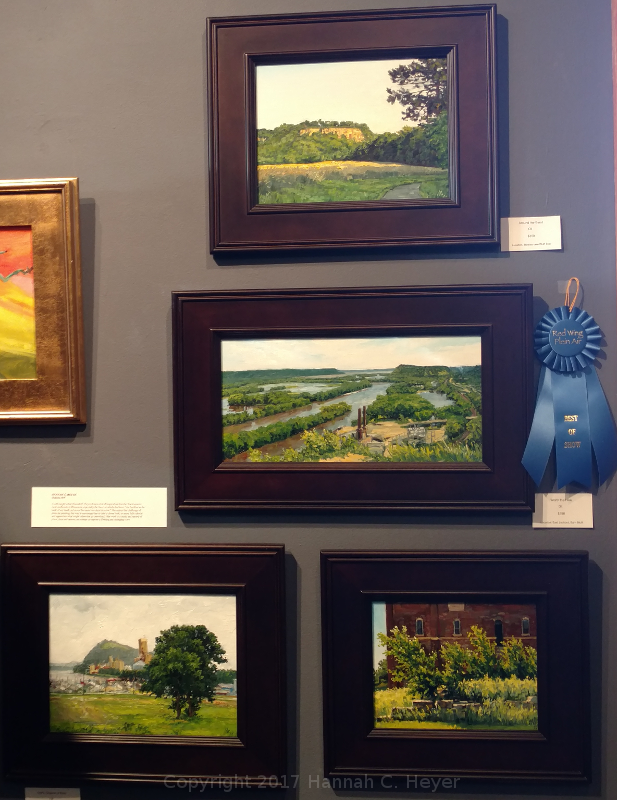 I was surprised and so very grateful to receive Best of Show for my painting "Worth the Hike"! Perched on top of some round bales, overlooking the fields. Watching the clouds pile to the south and move to the east and the wind make waves in the tall grass, listening to the blackbirds and bobolinks call. The grasses this time of year are full of texture and subtle colors as they flower and seed. The weedier parts of the fields are full of white cockle blooms and the tall flower spikes of yellow dock. The sky was mostly clear towards the end of the first painting, but some distant clouds in the east showed pink as they caught the last light of the sunset. 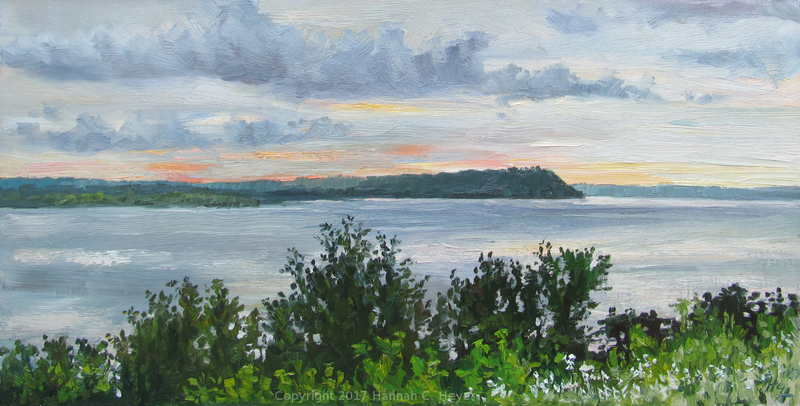 Clearing Skies at Dusk, 9 x 12" plein air oil on linen/birch. There was just enough light, and just enough time, to paint another quick study: The moon rising above the southern-facing fields.